Although these little 90cc off road beasties are fairly common in the USA, they are rare in the UK. We did buy, ride around and sell one of these in late 2010 / early 2011………..
**Please Note** As with most older bikes, it can be very difficult to get ACCURATE information, do PLEASE don’t take the info on this page as gospel!!! 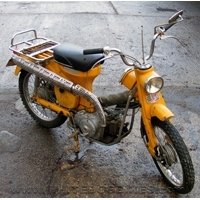 The Honda CT200 was originally sold to the hunter and fisherman market (there was an optional gun holder as a genuine Honda accessory for this bike!) in the US between 1964 and 1968. Extra features included large rear carrying rack, off road tyres, 2 sets of sprockets on the rear wheel and a non sparking exhaust can!